The objective is to build the raft that will support the whole team and complete the course around the lake, or to get to the other side of the river! Your raft needs to be sturdy in it's construction...or you risk a swimming race! 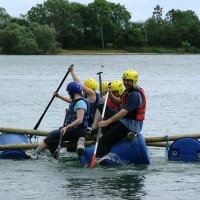 Raft building is a perfect water activity whatever the type of event you are planning. 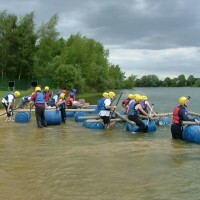 Whether it be a Stag Party or Hen Weekend, to a School Activity Day or Corporate Fun Day, Raft building combines team working, competition and of course lots of laughs. The competition starts by building your raft out of the available materials - possibly with a bit of help from your guide. Our instructors will help you with designs and teach you a selection of knots to get you on your way.